Plant a tree in memory of Robert "Bud"
Be the first to share your favorite memory, photo or story of Robert "Bud". This memorial page is dedicated for family, friends and future generations to celebrate the life of their loved one. Robert ‘Bud’ Sevalstad was born on March 28, 1929 in Black Eagle, Montana. He peacefully passed 2 weeks after his 90th Birthday on April 11, 2019. He lived a very full life of fun and adventure. Fishing every hole on the Missouri and Sun River he could get to. Bean Lake may have been his favorite but never the only one to try. He loved hunting Elk on the Game Range. Everyone knows how he cherished his drives through Augusta to scope out the wildlife and see the river up to the Gibson Dam. Best of all were his two stops on the way home for Chicken and Ice Cream. Bud left school early to pursue his dreams. Followed closely behind was his lifelong friend Artie Robinson. Artie still wonders why he marched out with him that day. But our dad Was and Is the “John Wayne” figure in our lives, everyone loved him. First he went to work at the Anaconda Co. Smelter. In 1948, he joined the Army during the Korean War. He was a Sergeant in the 1st Calvary and honorably discharged Nov 13, 1951. He is a proud Veteran of the Foreign Wars (VFW). Bud married Betty Mae Fayden on Mar 22, 1952. They were married 47 years and had four children. Paula Kendrick and spouse John: Aurora, CO, Suzi Sevalstad: Great Falls, MT, Ken Sevalstad and beloved wife Sharon: Great Falls, MT, and Lori Sena and spouse Ivan: Wasilla, AK. One of our family’s fondest memories was living in Wisdom, Montana. There, Dad and Mom owned and operated the Antler Bar. After moving back to Great Falls, Bud went to work at Kernaghan’s Service Station. 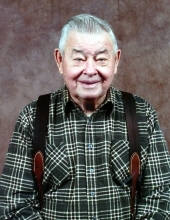 For 37 years he worked as a mechanic, tires, and hauled fuel to many farms and ranches all around Great Falls. Bud was preceded in death by his father, Lars Sevalstad and mother Albina Wilda; sister Lorriane; wife Betty Mae; and his longtime friend/companion Marla Leonard for 16 years. Loving and missing their Grandpa forever are Roy Lee Degenstein, Tanya Sue Dooley, Merle Soloman Sena, Jason Lars Kendrick, Kenny Robert Sevalstad Jr, Jennessee Ann Sena/Farris, Lara Adele Kendrick, Tyson Lars Sena, and Kory Frank Sevalstad; as well as his 13 great-grandchildren, and one great, great granddaughter. A Celebration of Life is planned for Monday, May 6th at 5:00 p.m. at the 3D International Restaurant, 1825 Smelter Ave, Black Eagle, MT 59414. Hot food will be provided. In lieu of flowers, we ask you to donate to a Veteran’s organization of your choice. To plant a tree in memory of Robert "Bud" Sevalstad, please visit our Tribute Store. "Email Address" would like to share the life celebration of Robert "Bud" Sevalstad. Click on the "link" to go to share a favorite memory or leave a condolence message for the family.